GET RID OF ALL ANIMAL INTRUDERS – Blasts all animal intruders out of your property by emitting powerful ultrasonic sounds and flashing LED lights. Eliminate roaming pest animal problems with this aggressive ultrasonic and flashing light animal repeller. 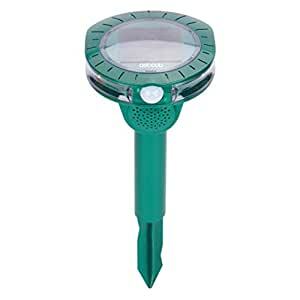 Features two (2) ultrasonic frequency settings, plus an optional on/off LED flashing light. ¡ï¼A: 13KHZ 15KHZ 17KHZ 19KHZ 21KHZ 30KHZ B: 14KHZ 17KHZ 20KHZ 23KHZ 26KHZ 40KHZ C: 15KHZ 19KHZ 23KHZ 27KHZ 31KHZ 50KHZ 3. Insert unit at suitable place that you want. 4. Additional charging way: it can use DC 5.5V 300mA adaptor to charge battery when there is not sunshine. ( not including) 5. When the power is under 3.6V, the unit starts to under-voltage mode, LED will be flashing every 5 seconds to remind that unit should be re-charging. After 2hours, the unit enters into lower power mode. 6. The LED flashing and sound emitting cycle is 5 second every time. â Warning: 1. This is not toy, please keep far away from children. 2. Do not suggest to use it under bad weather, like rainstorm, long time rainy season as it is electronic products.